I meant to blog this recipe over the weekend for a friend but was too tired, so apologies Diane for the delay! These are really so simple to make. But they taste amazing and are very rewarding therefore to make and scoff. Be patient – the rising phase can take longer than you think if the dough is in a cold place, but it’s worth the wait. This is a slight variation of Nigella’s cinnamon buns on p322 of her Domestic Goddess book. Begin by making the dough. Mix together the flour, sugar, salt and yeast. I do all this in my food mixer with the dough hook but you can do it by hand just as easily. Meanwhile melt the butter and add to the eggs and milk. Mix thoroughly then mix into the flour mixture. This makes a VERY wet dough but don’t be tempted to add more flour or the buns will have a very dense and close texture and what you want is all the magic yeast to do it’s thang and make lots of air bubbles for light and airy dough. If you mix and knead by hand, oil your hand first! Once combined, knead the dough for about 10 minutes until soft and elastic. Then cover the bowl (removing any dough hook if done by machine) with cling film and leave to rise for 25-60 mins until doubled in size. Whilst the dough is rising, make the filling. Mix the soft butter with the sugar and cinnamon into a yummy smelling paste. Line a 33cm x 24cm baking tin with greaseproof paper. When the dough has risen, tip it out on to a lightly floured surface and cut off 1/3. Pull into a rectangle the size of the tin and use this smaller piece of dough to line the bottom of the tin to form the base of the finished buns. Pull the remaining dough into a rectangle again the same size as the tin. It’s easier to shape it by hand than roll because it’s such a wet sticky dough. Don’t worry if you get messy doing this bit! 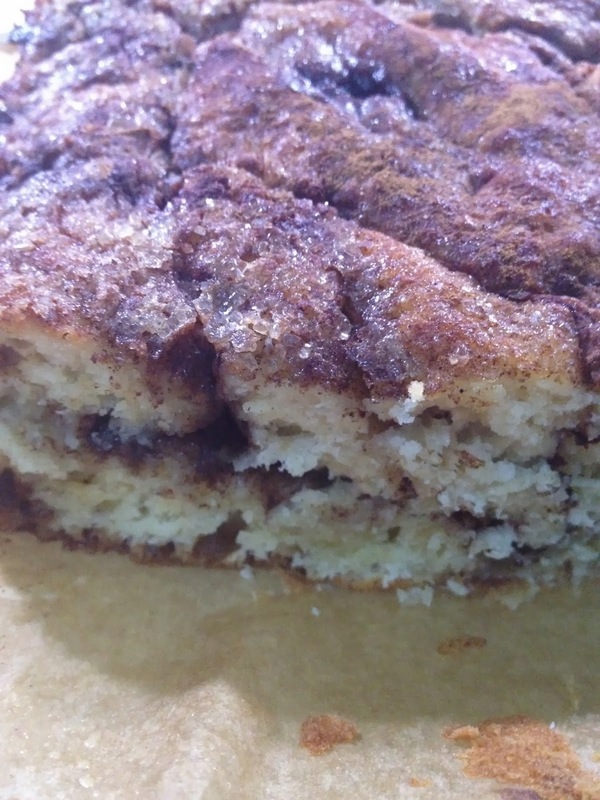 Spread the cinnamon butter over the dough and then roll up like a swiss roll. Cut into 20-24 slices and place then in the tin onto the pre- dough lined base. 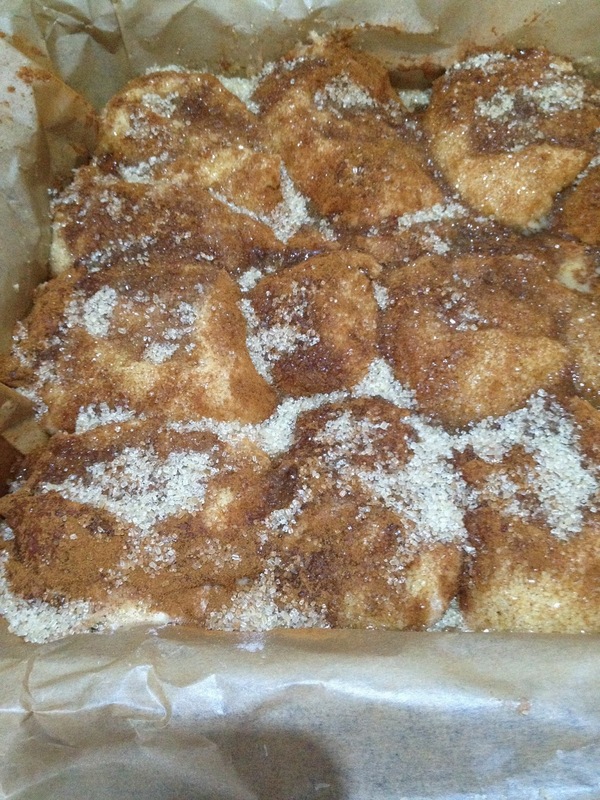 Brush the buns with beaten egg then sprinkle over the sugar and remaining cinnamon. Leave the buns to puff up a bit for 15 mins whilst you preheat the oven to 210 degrees.